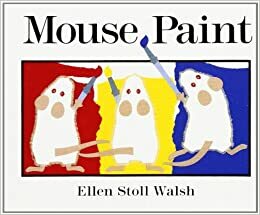 Kindergarteners read the book Mouse Paint by Ellen Stoll Walsh as part of their study of color. Students are currently learning about primary and secondary colors and the color wheel. After reading the book, students created Mouse Paint-inspired color wheels. Students used primary colors to create their own secondary colors. Then, they turned the colored paper into mice, added details to the face and different kinds of lines for tails!